Normally for Play of the Game, a win leads to a touchdown or other big play for Nebraska while a loss equals the turning point or a play that encapsulates the reason for the loss. However, this week, the Play of the Game is a big play by Nebraska that ultimately led to what sealed the game for Wisconsin: Aaron Williams’ pick-six off of Alex Hornibrook. Trailing 17-10 at the beginning of the second half, Nebraska and Wisconsin traded four-and-out possessions which left the Badgers with the ball at their own 12-yard line following a booming 57-yard punt by Caleb Lightbourn. On first down, the Blackshirts stuffed Wisconsin running back Jonathan Taylor for no gain, setting up second and 10. Hornibrook dropped back to pass and looked to his first option to the left side of the field; not open. He progressed to his second read up the middle, also not open. Finally, he turned all the way to the right side of the field and fired to his third read. Safety Aaron Williams read Hornibrook’s progressions and began closing on an open receiver 3 yards past the line of scrimmage running across the numbers. Williams runs right through the pass and picks it off, running it right back 14 yards for the touchdown. 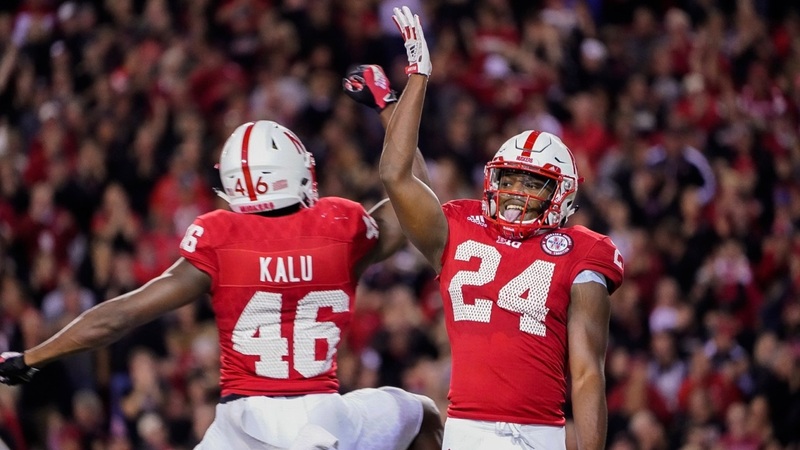 Finally, a defensive score goes in Nebraska’s favor as it had four times previously for the opponent. It was a phenomenal play by Williams and followed up a couple of incompletions by Hornibook that were very close to being picked off on the previous play. It tied the game at 17-all with just under 11 minutes to play in the third quarter. However, this is the play of the game not because of what it did for Nebraska. Rather, the effect it had on Wisconsin is the reason for its selection. Following the pick-six, Wisconsin ran the ball 29 times for 189 yards (not including a kneel-down at the end). They passed the ball just twice — a crossing mesh route that his receiver turned into a 31-yard gain and a 5-yard touchdown pass on a play where the cornerback fell down. Both passes were on third down, but they were third and very manageable. Wisconsin took the ball out of its quarterback’s hands and gave it to Taylor, and Nebraska simply couldn’t stop him. On the kickoff following Williams’ touchdown, Kieron Williams forced a fumble, which the Badgers recovered. Wisconsin also committed a holding penalty during the return and then a personal foul afterward, moving the ball back to the 7-yard line. It didn’t matter, however, as the Badgers marched 93 yards down the field on 10 plays to re-take the lead. Wisconsin ran all the way to a 21-point victory, and it all started with a game-plan shift following Hornbook’s interception. That’s why Aaron Williams’ pick-six is this week’s Play of the Game.